The makers of DoorJammer, the award-winning portable door security device, have introduced their new “Lockdown” product to deal with threatening situations in public buildings. 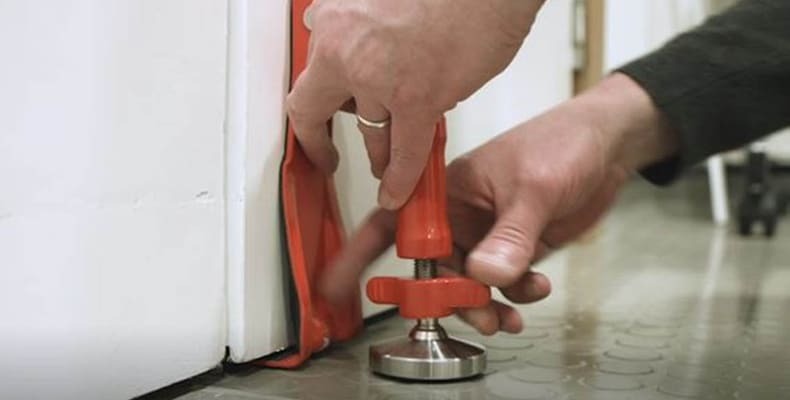 Under pressurised conditions where a large number of people may be at risk, “DoorJammer Lockdown” can be quickly deployed to secure doors – therefore barricading access to an intruder or attacker. Light in weight (822gms), but very strong and made of steel, “DoorJammer Lockdown” provides extra robust security for inward opening doors. It can be quickly fitted in seconds and valuable time isn’t wasted hunting for keys or padlocks. The device’s flange goes under the gap of the door (minimum gap 3mm) and the bolt is twisted to secure. “DoorJammer Lockdown’s” clever mechanism means that the more the intruder attempts to push or kick the door, the more the device stays in place – keeping the occupants safe on the other side. “DoorJammer Lockdown” helps universities follow current Police and National Counter Terrorism’s (NaCTSO) advice, to “RUN, HIDE, TELL” – and when hiding, create a safe place by barricading yourself in. “DoorJammer Lockdown” is UK Police accredited via their “Secured by Design” initiative, including successfully passing the rigorous PAS24 impact resistance standards on complete door frames. This included a direct impact test of up to 50kg of force at the device’s fullest possible extension. When urgent evacuation of the secured room or area is required, “DoorJammer Lockdown” can be swiftly removed by the occupants. “DoorJammer Lockdown” is cost effective, as expenditure on replacement of doors and locks is avoided. An overall winner at last month’s British Invention of the Year Awards, “DoorJammer Lockdown” is priced at £39.99 (ex-vat), with free postage on orders over £50. “DoorJammer Lockdown” is great value for money – but for peace of mind, its priceless!